Translation of a book is always more difficult than writing the book itself. While translating a book, the translator has always to face a twofold problem, whether to give a verbatim translation of it, or to reproduce it in another language in the form of an independent writing. In the former, the translation loses the charm of an idiomatic writing in that, in it the grammatical order of noun, pronoun, verb, adverb, adjective etc., of the language in which it is translated is not maintained, and therefore, instead of presenting an interesting reading, it creates a sort of disgust in the mind of the reader. In the second case, it deprives itself of the character of translation in its strict sense if the translator exceeds the substance, and for the sake of elaboration also includes his own ideas. Yet another way is to confine within the bounds of the original work and give verbatim translation by putting the wordings in the grammatical order and literary standard of the language in which it is translated. This is though difficult but comparatively more appropriate and pleasing in that the reader finds it interesting to read and easy to understand the substance of original work. This is as regards the books written by the human beings. But when we come to the Book of Allah, i.e. the Holy Qur’an, the task of translating it becomes still more difficult, rather impossible, and as such the agreed view of the learned ones is that it is not possible to give an exact translation of the Word of Allah, i.e. the Holy Qur’an, and that, I think was the reason that for centuries together the Holy Qur’an was not translated in any other language. In this connection, however, the Orientalists took the lead, and the first translation of Holy Qur’an was done in Latin which was published in 1143 AD. Then further translations, in French (1647 AD), Swedish ( 1874 AD), Hebrew (1851 AD), German (1772 AD), Dutch (1661 AD), English (1669 AD), Chinese ( 1923 AD), Portuguese (1882 AD), Danish ( 1919 AD), Bengali ( 1349 Hijri), and soon were published. In the subcontinent of undivided India, Shah Waliullah took the lead and translated the Holy Qur’an in Persian which was published in 1737 A.D. This was followed by Urdu translations by his sons Shah Abdul Qadir and Shah Rafiuddin, which were published in the 19th century A.D. The Urdu translation by Shah Abdul Qadir was verbatim, and was, and is still taken to be more authentic. Then Ashraf Ali Thanwi and Abdul Majid Daryabadi also translated the Holy Qur’an and wrote commentaries on it in Urdu. Mahmud Hasan Deobandi revised the verbatim translation of Shah Abdul Qadir and made it idiomatic. On it Shabbir Ahmed Usmani wrote his commentary known as Tafsir-i-Usmani. Mufti Muhammad Shafi also adopted the translation by Mahmud Hasan, and summary of the commentary by Ashraf Ali Thanwi in the form of “Khulasa-i-Tafsir’’, in his Ma’arif al Qur’an. Another important Urdu translation was done by Ahmed Raza Khan Barielwi known as ‘Kanz-al-Iman’, to which Na‘imuddin Muradabadi added his explanatory notes known as ‘Khaza’in-al-Irfan. Regarding this translation, general view is that it was done direct from Arabic text i.e. without taking any help from previous translations. Ahmad Raza Khan dictated the translation to his highly-calibred student Khalifa Amjad Ali A’zami. The original text of urdu translation is in safe custody of Idara-i-Tahqiqat-i-Imam Ahmad Raza. This view is elaborated by the research work of Professor Dr. Majeedullah Qadri, known as ‘Kanz-al-Iman aur Ma’aruf Tarajim-i-Quran’ (Karachi:1999), according to which Kanz-al-Iman is based on prominent Arabic Commentaries of the previous scholars. In this translation, Ahmed Raza Khan Barielwi departing from the general practice of the translators, according to which first the dictionary meaning and then the latent, hidden, underlying, or explanatory meaning or theme is described, has directly given the explanatory meaning and theme of the words and phrases of the Holy Qur’an. Additionally, in the translation itself, out of extreme love for the Holy Prophet Muhammad ( ), he has also frequently used the words and phrases of love, respect and honour for him, which in fact are not obviously spelled out from the Arabic text of the Holy Qur’an. According to my own humble view, explanatory meaning must always be accompanied by dictionary meaning in brackets. This practice has been observed in Mazhar al-Qur’an. All the above mentioned commentaries are of the nature of ‘Tafsir bil Mathur’ i.e. commentaries following the interpretations by the Holy Prophet, his companions, and all subsequent scholars following them. In the twentieth century A.D., however, commentaries of the nature of ‘Tafsir bi al- Ra’i’’ have also come up in which translation has been based only on personal opinions and understanding of the translator. Tafheem-ul-Quran by Syed Abul A’ala Maududi and Tadabbur-i-Quran by Amin Ahsan Islahi come in this category. 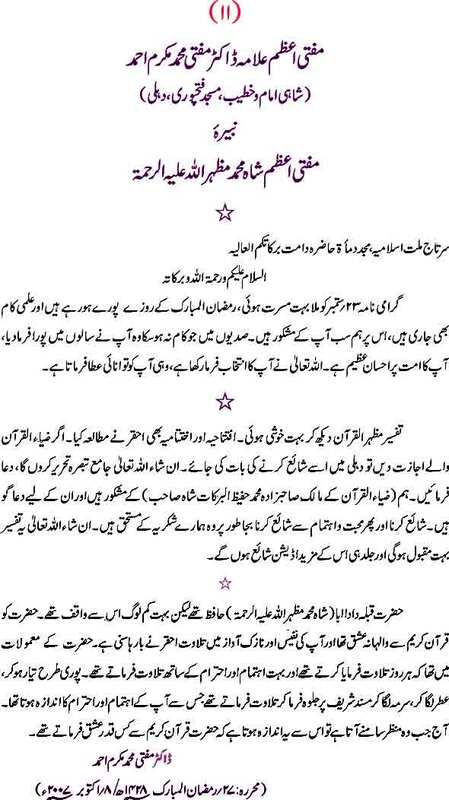 The Persian translation of Shah Waliullah has been rendered into Urdu by Mufti Muhammad Mazharuallah Shah (d. 1966 AD), the late grand mufti, imam and khatib of the Shahi Masjid Fatehpuri of Delhi. 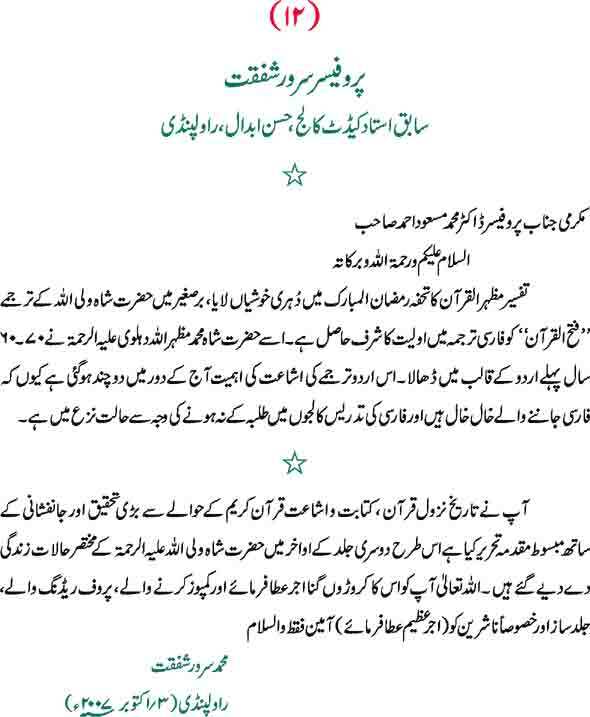 Mufti sahib has also added explanatory notes to it. 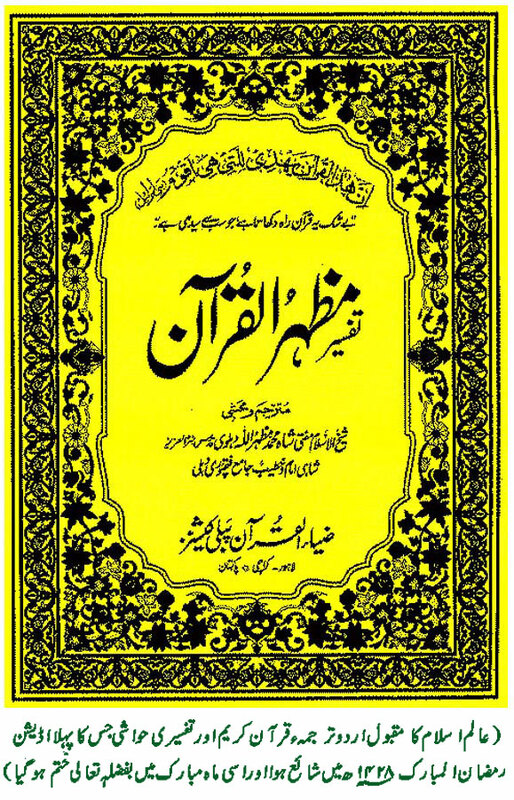 It was written in 1940 A.D. and first published by Iqbal Printing Press, Delhi in 1942 A.D. and it has now been re-published this year (2007 A.D.) by the name ‘Tafsir-i-Mazhar-al-Qur’an by Sahibzada Hafiz al- Barakat Shah of Ziaul Quran Publications, Lahore. Professor Dr. Muhammad Mas‘ud Ahmad, the illustrious son of the late Mufti Sahib, has very kindly sent to me a complimentary copy of this great work of his great father, and has also asked me to write a comment on it. I do not feel myself competent enough to do so. I am neither an Scholar nor expert to give opinions on such works of high standard, particularly of scholars of high caliber, knowledge and standing, and who are also the spiritual leaders. Mufti Muhammad Mazharullah Shah was a great Scholar and Mufti of his time. He was born in Delhi in the year 1884 A.D. in a highly respectable family of religious scholars and mystics of Naqshbandia Order. 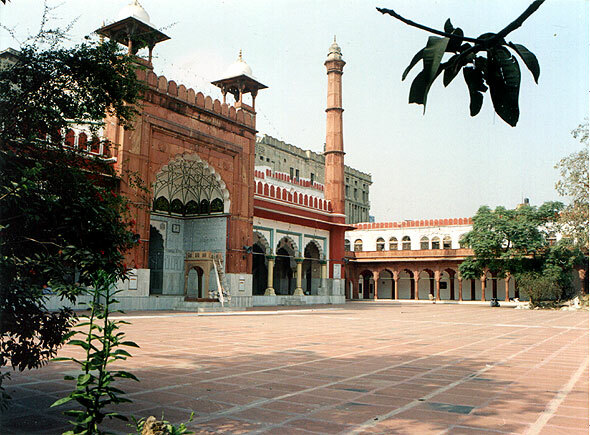 After completing his education of Qur’an, Hadith and Fiqh, he occupied the seat of his renowned grand father Faqihul Hind Shah Munammad Mas‘ud (d.1892 A.D.) as Imam and Khatib of Shahi Masjid Fatehpuri Delhi, and spent all his life in serving the Ummah devoting himself totally to the teachings of Qur’an and Hadith and issuing Fatwa on important problems relating to the individual as well as social life of the Muslims of India. After rendering memorable services for the cause of Islam for over seventy years, he died in 1966 A.D. and was buried in the courtyard of Masjid Fatehpuri Delhi itself, where his Mazar still exists, and each year people of Pak-o-Hind gather to celebrate his death anniversary and pay homage to him. Professor Dr. Muhammad Mas‘ud Ahmad, apart from his own many marvelous works in the form of articles and books, has also rendered great service for the cause of Islam, by getting published firstly the Fatwa of his illustrious father in the name of Fatawa-i-Mazhari and now his translation and commentary of Holy Quran entitled as Tafsir-i-Mazhar al-Qur’an. I have gone through Fatawa-i-Mazhari, word by word, and found many of them as very well written research articles, which, if published separately in the form of booklets, may be extensively read and enlighten the readers on many problems of our day to day life. The translation is verbatim, but it is according to the grammatical order and literary standard of the Urdu language, and, therefore it is easily readable as well as understandable by the readers. This translation has adopted the generally extant practice of translation i.e., first the dictionary meaning of words and phrases of the Arabic text has been given and then, wherever necessary, underlying or explanatory meaning has been given in the explanatory notes or brackets. Additional words needed to clarify the dictionary meaning have been given in the brackets so that they may not appear to have been spelled out from the Arabic text. The commentary is not tread bare, i.e. covering the whole Qur’an, verse by verse. It is in the form of explanatory notes on particular important words and phrases needing explanation. It is of the nature of Tafsir-i-Mathur i.e. following the interpretation by the Holy Prophet Muhammad ( ), his companions, and all subsequent scholars following them. In the beginning of each Surah, necessary details regarding its name, occasion of revelation, subject matter, blessings and other qualities have been given. In the explanatory notes, the latent, hidden, underlying or explanatory meaning has been given, and different views of prominent commentators have also been mentioned so that the readers may be fully enlightened on all aspects of the Arabic text. Issues relating to Fiqh, arising out of any verse of the Holy Quran have also been fully explained. Explanatory notes have been put under suitable headings to make easy the understanding of the subject matter dealt with therein. This is something which I have never seen in any other Urdu commentary of the Holy Quran. Explanatory notes are in simple and easy language so that even a reader of ordinary intelligence and knowledge can easily read and understand them. Generally the translation as well as the commentary, both are in plain, simple and day to day language which is readable with interest and understandable with ease. The explanatory notes are brief yet cover all necessary aspects of the subject. All possibly arising issues, including the problems of Fiqh, relating to human life, have been nicely and concisely explained. The book as a whole is well written, and is a valuable contribution by a great scholar, Mufti and mystic of his time, to the already existing huge literature relating to the Holy Qur’an. His worthy son Dr. 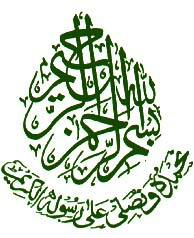 Professor Muhammad Mas‘ud Ahmad has no doubt rendered a good service for the cause of Islam by getting it re-published in Pakistan with full cooperation of Sahibzada Hafiz al-Barakat Shah, after about sixty five years of its first publication in the undivided India. May Allah reward both, the FATHER and the SON, with His pleasure and choicest Mercy and Grace and make this work an asset for them for the hereafter, Aameen.